This blog post is excerpted from book VII, chapter XXI of Augustine’s Confessions. 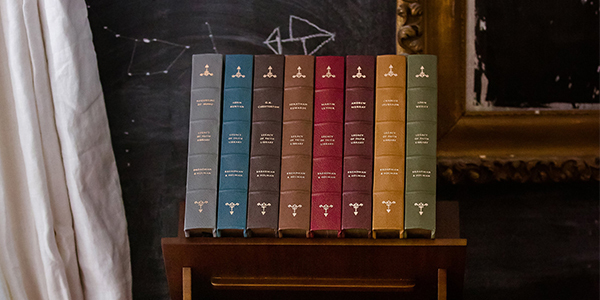 You can find more of Augustine’s writings and those of many other Christian thinkers, pastors, and leaders in the Legacy of the Faith series. In this passage, Augustine describes how he started reading the Bible. As he read, he realized the Bible holds all the truth that he’d seen in philosophical books (those by “the Platonists”). However, that truth is “expanded” with God’s grace, so that it can offer real hope to sinful people. With great eagerness, then, I fastened upon the venerable writings of thy Spirit and principally upon the apostle Paul. I had thought that he sometimes contradicted himself and that the text of his teaching did not agree with the testimonies of the Law and the Prophets; but now all these doubts vanished away. And I saw that those pure words had but one face, and I learned to rejoice with trembling. So I began, and I found that whatever truth I had read [in the Platonists] was here combined with the exaltation of thy grace. Thus, he who sees must not glory as if he had not received, not only the things that he sees, but the very power of sight–for what does he have that he has not received as a gift? By this he is not only exhorted to see, but also to be cleansed, that he may grasp thee, who art ever the same; and thus he who cannot see thee afar off may yet enter upon the road that leads to reaching, seeing, and possessing thee. For although a man may “delight in the law of God after the inward man,” what shall he do with that other “law in his members which wars against the law of his mind, and brings him into captivity under the law of sin, which is in his members”? Thou art righteous, O Lord; but we have sinned and committed iniquities, and have done wickedly. Thy hand has grown heavy upon us, and we are justly delivered over to that ancient sinner, the lord of death. For he persuaded our wills to become like his will, by which he remained not in thy truth. What shall “wretched man” do? “Who shall deliver him from the body of this death,” except thy grace through Jesus Christ our Lord; whom thou hast begotten, coeternal with thyself, and didst create in the beginning of thy ways—in whom the prince of this world found nothing worthy of death, yet he killed him—and so the handwriting which was all against us was blotted out? The books of the Platonists tell nothing of this. Their pages do not contain the expression of this kind of godliness—the tears of confession, thy sacrifice, a troubled spirit, a broken and a contrite heart, the salvation of thy people, the espoused City, the earnest of the Holy Spirit, the cup of our redemption. For it is one thing to see the land of peace from a wooded mountaintop: and fail to find the way thither—to attempt impassable ways in vain, opposed and waylaid by fugitives and deserters under their captain, the “lion” and “dragon”; but it is quite another thing to keep to the highway that leads thither, guarded by the hosts of the heavenly Emperor, on which there are no deserters from the heavenly army to rob the passers-by, for they shun it as a torment. These thoughts sank wondrously into my heart, when I read that “least of thy apostles” and when I had considered all thy works and trembled.